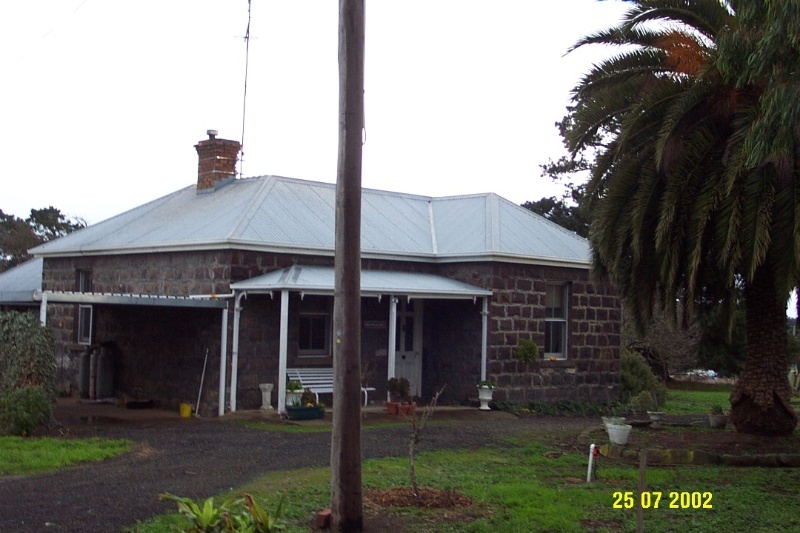 Drumlayne, located on the Henty Highway immediately west of the crossing with Muddy Creek, is a single-storey, asymmetrical bluestone house. The house is in a much-reduced version of the Italianate style, fashionable at that time. It appears to have been built soon after the land was purchased by William Watson in 1872. Little is known of Watson who may have been acting as a dummy for local squatters but may also have wanted the block near the creek for strategic reasons. There was a William Watson who operated a tannery at Rosebrook from very early times. For most of the early twentieth century the property was run as a dairy farm by the Kirkwood family and, through their daughter Dorothy, the Pitman family from 1953. A small woolshed also allowed for sheep, fat lambs and wool. The main block was subdivided in 1986 and has had a series of residential owners subsequently. This triggered changes and modernisations. The house is in good condition and retains a fair degree of integrity. The woolshed and dairy also survive in fair condition. Drumlayne is of historical significance to the Southern Grampians Shire. Drumlayne is of historical and architectural significance as a modest example of domestic architecture representing the Land Selection period and subsequently as a the residence associated with a small mixed farm in the twentieth century. 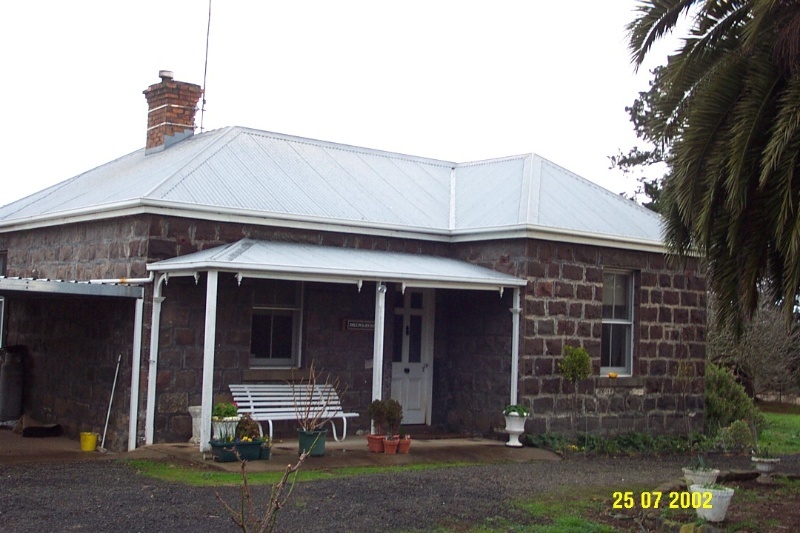 The house is in good condition and the woolshed and dairy are in fair condition. Only the palm is of interest in the garden. Drumlayne is a simple single-storey bluestone house with an asymmetrical facade about a central front door. It is designed in a much reduced version of the Italianate style which had been used for major residences such as Warrayure and Koornong. The masonry construction of the walls is relatively crude. The timber front verandah is plain and may be missing minor details such as the quadrant brackets terminating with turned finials. The double hung sash windows are divided into four panes. This and the verandah suggest a date of construction in the late 1860s or 1870s, that is probably about the time the land was selected in 1872. The hipped roof is now covered with corrugated galvanised iron. The single chimney, opposite the verandah window, is constructed with brown bricks. There have been alterations and extensions at the rear. There is a mature Canary Island Palm, Phoenix canariensis, on axis in front of the house. The small timber woolshed and dairy are believed to survive as outbuildings.